My husband loves Cameron’s Seafood on Buckeystown Pike, just around the corner from the Common Market. Their stuff is definitely very fresh. Over in New market is a pretty good place, Lighthouse Seafood. They are the storefront of a seafood distributor. I’ve never asked them to source their stuff but it has always been really fresh. I second the Lighthouse Seafood suggestion. Also a great place to pick up steamed crabs. Third vote for Lighthouse Seafood. 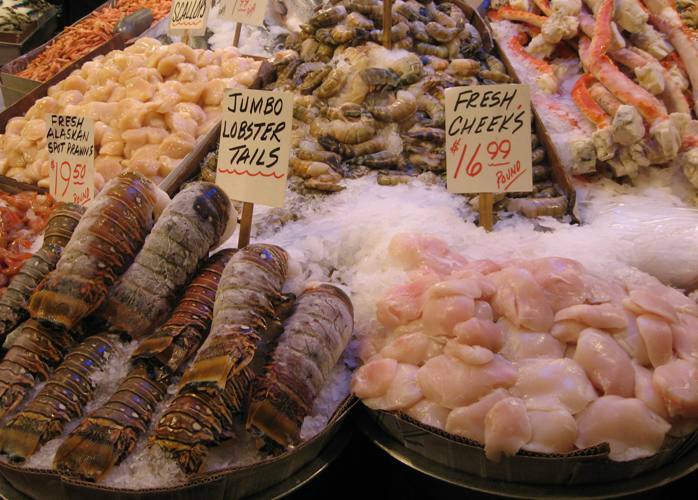 Great seafood (meats, salads, and cheese as well). Their coleslaw is often (but not always) great. We’ve been to Cameron’s, Giant Eagle (which isn’t bad), and Giant. Nothing compares to Lighthouse. Cameron’s was adamant their salmon was wild caught – until we pointed out that a deep orange color typically indicates dyed farm raised salmon. Then they changed their tune and confirmed that it was indeed farm raised. No thanks. If you can hold out until spring, Wegmans has exquisite seafood. Can’t wait? A trip to the Leesburg Wegmans is in order.